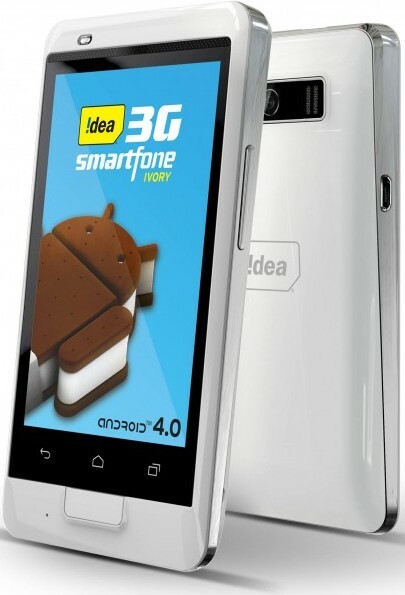 Idea Ivory, a Dual SIM GSM smartphone features 3.5-inch touchscreen display. It is powered by 1GHz processor with 512MB of RAM and runs on Android 4.0 Ice Cream Sandwich OS. 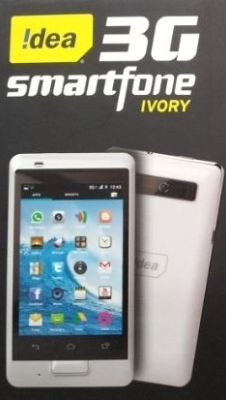 Idea Ivory comes with 4GB of storage which can be expandable up to 32GB Via. microSD card. It sports 2MP rear camera. It comes with a standard 1300mAh battery. Connectivity options of Idea Ivory includes 3G, Bluetooth, WiFi, aGPS and NFC or Miracast mirroring. It comes in shades of black or white. The Idea Ivory comes with a price tag of Rs. 7,390 and has an initial recharge offer which includes free Idea TV and 1GB/month data usage for 3 months @ Rs. 261. Tags:Idea Ivory, Idea Ivory features, Idea Ivory specifications, Idea Ivory review, Idea Ivory details, Idea Ivory availability, Idea Ivory specs, Idea Ivory images, Idea Ivory pics, Idea Ivory pictures, Idea Ivory price.